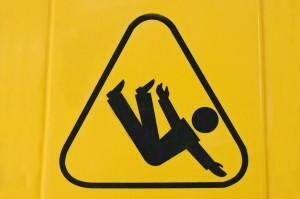 Slips and falls cause millions of serious injuries every year in the United States. In fact, they may turn out to more traumatic than previously thought. New research from Johns Hopkins has determined that slip and falls have overtaken car crashes as the leading cause of traumatic spinal cord injuries in the United States. In this study, 41.5% of spinal cord injuries were caused by slip and falls, making it the leading cause of traumatic spinal cord injuries over the 3-year study period. Motor vehicle crashes caused 35.5% of all these types of injuries, putting it in second place. Overall, spinal cord injuries caused by slip and falls increased throughout the course of the study. The research shows that the rates of these injuries are rising fastest among older people. The Johns Hopkins research also suggests that further efforts to prevent falls in older adults could significantly help efforts to decrease the number of spinal injuries. The authors of the study suggest that more resources should be dedicated to preventing these types of injuries in the elderly. “We have demonstrated how costly traumatic spinal cord injury is and how lethal and disabling it can be among older people…it’s an area that is ripe for prevention,” said Shalini Selvarajah, M.D., M.P.H., a postdoctoral surgical research fellow at the Johns Hopkins University School of Medicine and leader of the study. Between 2007 and 2009, the researchers analyzed a sample of 43,137 adults in emergency rooms in hospitals across the United States who were treated for spinal cord injuries. Improved health patterns were noted in younger adults. The incidence of spinal cord injuries happening to patients from the ages of 18 to 64 ranged from 52.3 per million in 2007 to 49.9 per million in 2009. However, the opposite pattern was seen in senior citizens. The rate of these injuries in patients aged 65 and older increased from 79.4 in 2007 to 87.7 in 2009. Furthermore, spinal cord injuries experienced by elderly patients tend to have more severe consequences. Elderly patients are four times more likely to die in the emergency room form a spinal cord injury than younger patients are. They are, moreover, six times more likely to die during an inpatient hospital stay. The researchers could not pinpoint exact reasons for the increasing number of spinal cord injuries caused by falls, but speculated that the aging of the United States population and the more active lifestyles of seniors had contributed to the rise in these injuries. Whatever the reasons, no elderly person should have to suffer a fall that could have been prevented. If you or a senior that you care about has been injured in a slip or fall accident that was due to the negligence of another person, contact us at Van Sant Law today. We are available 24/7 to set up a free consultation to discuss your case in detail.